Correctional officers work in correctional facilities housing criminals and individuals awaiting trial. These professionals are also called detention officers. They monitor prisoners, provide security, prevent inmate fights, and transport inmates. Correctional officers are only authorized to handle inmates within the correctional facility they're assigned to. Correctional officers are employed at sheriff's departments, police agencies, municipal jails, and federal and state prisons. Elected sheriffs manage municipal jails. Inmates are continuously being admitted to and exiting prions since new individuals are always being arrested, transferred, or released. Correctional officers process more than 11 million inmates a year within American jails. Newly arrested and incarcerated people pose the highest risk to correctional officers since not much is known about them. Correctional officers are typically employed at large jails and state and federal prisons. They also supervise individuals apprehended by the Immigration and Naturalization Service. Correctional officers also frequently work at correctional facilities which are privately owned. Working at a correctional facility can be dangerous, but it's typically safer working at a facility housing inmates with long prison sentences since more is known about these individuals. Correctional officers write reports detailing inmate behavior and progress. Unusual behavior, security breaches, and rule violations are documented by correctional officers. They frequently investigate inmate misconduct and keep daily records. Officers are required to report any rule violation and refrain from favoritism. Unarmed officers with communication technology are employed within correctional facilities containing direct supervision cellblocks. Those working in facilities with 50-100 inmate cellblocks typically work together with other correctional officers. Rules are enforced at these facilities by revoking privileges. Additionally, correctional officers are employed at centralized control facilities containing computer tracking systems and closed-circuit security cameras. Criminals imprisoned in solitary confinement are typically monitored by officers within these facilities. Correctional officers frequently use handcuffs and leg irons when transporting these inmates. Correctional officers are usually required to hold at least a high school diploma or GED. The Federal Bureau of Prison's correctional officer entry-level requirements include a bachelor's degree at a minimum, 3 years work experience supervising, counseling, or assisting others, or combined work experience and education. Most state and municipal correctional facilities have minimum education requirements, but law enforcement and military experience can often be used as a substitute for these requirements. Federal, state, and certain municipal corrections facilities offer essential law enforcement training for their employees. Training programs are based on American Jail Association and American Correctional Association guidelines. Regional training centers available to law enforcement personnel are located within certain states. After correctional officers have completed preliminary corrections instruction, all correctional facilities provide extensive on-the-job training. Training includes instruction about dealing with inmates, institutional policies, and legal restrictions. Correctional officers are usually trained to carry firearms and defend themselves. Recently employed correctional officers typically complete several weeks to months of training from correctional officers with years of experience. Correctional officers completing formal training typically learn about organizational policies, regulations, custody procedures, and security. During their first year, correctional officers must complete 200 hours of training. Within 2 months after being hired, correctional officers must complete 120 hours of in-depth training at the Federal Bureau of Prison's training facility in Glynco, Georgia. Correctional officers often join tactical response teams. Officers joining these groups must complete training to learn how to respond to riots, disturbances, hostage situations, forced cell moves, and other dangerous situations. 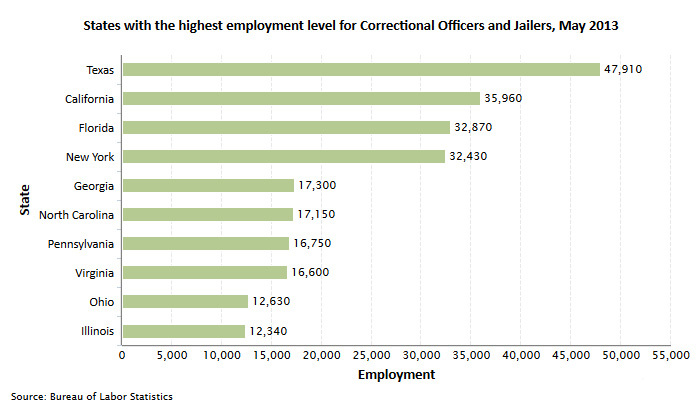 Job growth for correctional officers is projected to increase by 10 percent through 2018. Growth will be spurred by increasing incarceration rates and mandatory sentencing laws many states are now instituting.